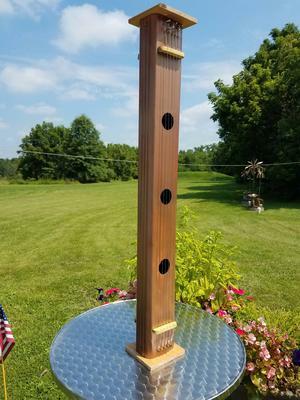 I watched the video on making an Aeolian downspout harp and proceeded to create one: a 3x4-inch, 3 foot long, 10 string, 2 sided wind harp. I thought it would be an interesting addition to my wind chimes. I decided that a 3x4-inch downspout, with the added width would be better. I cut a 3-foot piece, drilled 3 sound holes and spray painted it brushed copper. I cut two pieces of 2x4 to tightly fit in the ends and secured it with 2 brass screws on the narrower sides. I also cut two 5-inch square plates to put on the ends to protect the strings. 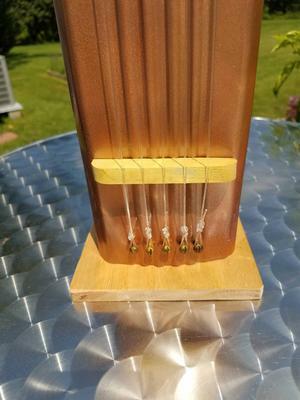 12 Standard Zither Pins — Great for Zithers, Harps and other Primitive Stringed Instruments by C. B. Gitty Supply. Grover 8020 Autoharp Tuning Hammer by Grover. KastKing DuraBlend Monofilament Leader Line, Premium Saltwater Mono Leader Materials, Big Game Spool Size 120Yds/110pound, 1.0mm by KastKing. I placed RH brass wood screws (because no threads at the throat) on both wide sides of one end. I tied a "double surgeons loop" on a string and looped it over each screw head. The other end went to the zither pins. I then randomly tightened them over some simple wood wedges notched for each string. I think the whole thing looks really nice, but I cannot get it to make any sound. The monofilament is round and smooth. Not sure why. Greg, thanks for sharing your Aeolian harp design with us. Your downspout wind harp is quite attractive and very well made. Getting the desired musical sound requires experimenting with the tension of the wires during a stiff breeze, and it can take time and patience. All part of the fun. Well, I couldn't get the Aeolian downspout harp to sing using the 1.0mm fishing leader monofilament. I invested in the same monofilament but with a 0.55mm diameter. It now sings beautifully. The volume is low, but it works fine now. 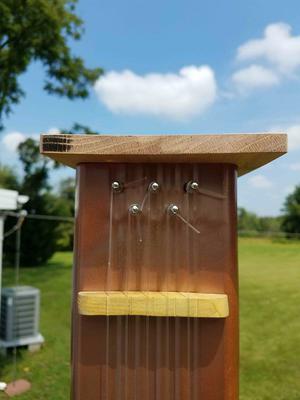 I have some disc piezo electric pickups, but hooking an amp to a wind harp seems wrong. I have 7 feet of leftover 4-inch downspout. I think I might go crazy and build one longer then maybe the 1.0mm monofiliment will be fine.